Ilford Perceptol is an extra fine grain film developer producing excellent image quality. Designed for use when very fine grain negatives are required but a decrease in film speed is not important. It exploits the superb grain structure of Ilford medium and slow speed films, Delta 100 Professional, FP4 Plus and Pan F Plus, and produces significantly finer grain in Ilford fast films, Delta 400 Professional, HP5 Plus and Delta 3200 Professional, compared with a standard fine grain developer. 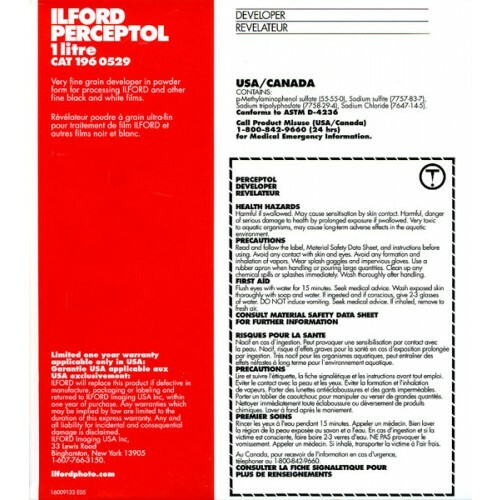 Ilford Perceptol - 1 litre of developer powder.